In 1945, the original homestead at Baptcare Strathalan Community was built to provide aged care services to Macleod and its surrounds. This marked the beginning of our not-for-profit organisation, which was borne out of a desire to care for people and local communities – a tradition that we’re proud to say still continues. 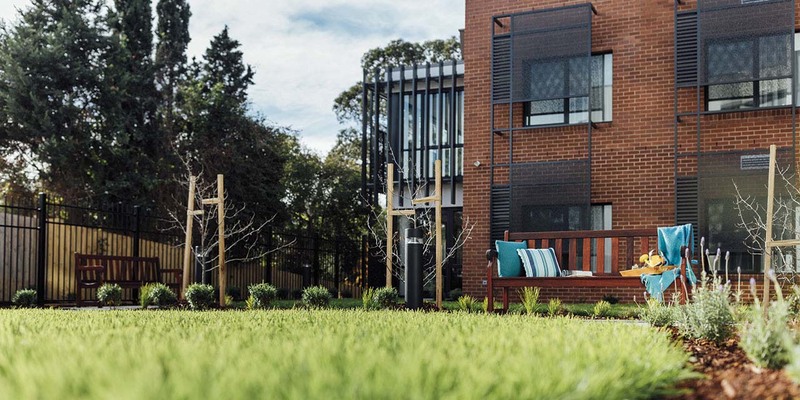 Leafy surrounds set the scene for the warm and inviting Strathalan Community, which was recently redeveloped in 2016 to the highest of standards while still maintaining its rich sense of history. Residents enjoy bright and sunny, modern rooms complemented by attractive, flowing communal spaces such as the spacious lounge areas, landscaped courtyards and a beautiful winter garden that can be enjoyed in all weather conditions. With our caring and experienced nurse-led team, we can accommodate all levels of care requirements. So rather than imagining the life that you could be living at Baptcare Strathalan Community, why not come in and see for yourself? Our friendly site managers are always happy to conduct personal tours. Our proud history, one dating back to 1945, is deeply rooted in community. Thoughtfully designed communal spaces and a diverse activities program (e.g. weekly exercises, music therapy, knitting circle, movies, bus outings and walking group) ensure that residents feel part of a supportive and inclusive environment. A secured walking path showcases our beautiful courtyard, while the co-located café is available to enjoy by all residents and visitors. Strathalan was fully redeveloped in 2016, with a focus on creating contemporary, comfortable living spaces while respectfully preserving the site’s historical character. Rooms and communal areas are spacious and filled with an abundance of natural light. Landscaped courtyards are directly connected to the main building, providing easy access for residents. Intimate dining rooms feature plush carpeting to minimise noise and the risk of slipping, while lounge rooms are fitted with stylish gas heater fireplaces to provide a cosy area during winter. For a quieter change of scenery, there are also more private seating areas located throughout the site. Our sheltered winter garden provides a stunning retreat that is available year-round, no matter what the weather. Coffee lovers can take comfort in knowing that a decent cappuccino is never far away – two coffee bars are available for resident use. 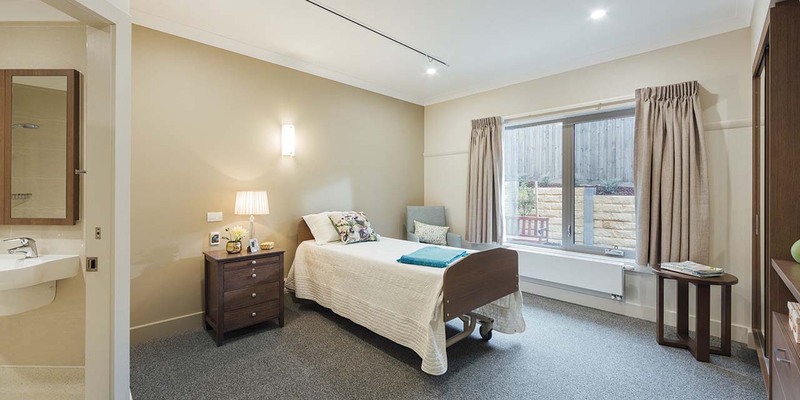 Following the redevelopment, Strathalan now features the latest in aged care living. 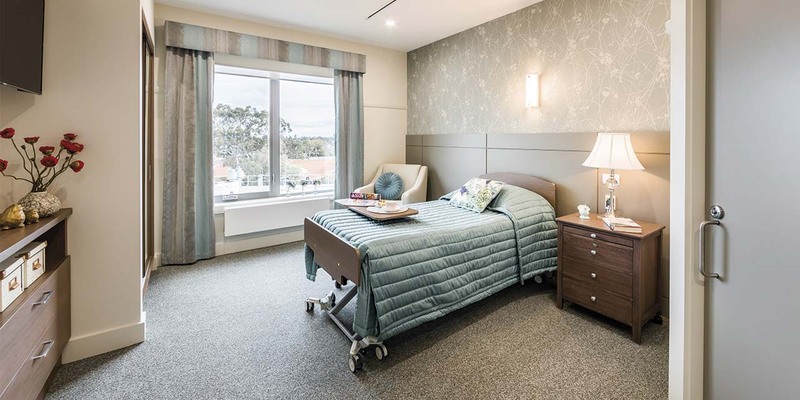 Concealed ceiling hoists and Hi-Lo beds with warm timber accents make it easier for residents with mobility issues to move in and out of bed – all without detracting from the overall appearance of the room. Ensuites are also fitted with a nurse call button for peace of mind. And because we know the importance of staying connected, every room has its own smart TV (WiFi and Foxtel available on request). 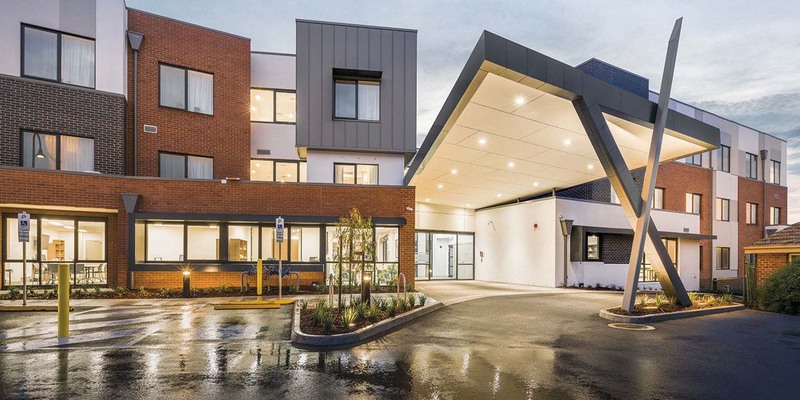 Our modern, recently redeveloped three-storey building features 124 private rooms and we cater for all levels of care requirements (low to high). 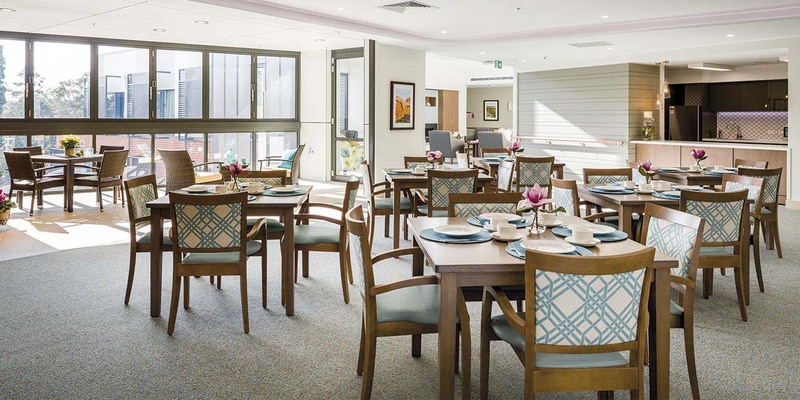 The layout of our facility encourages residents’ use of communal areas to enjoy meals and socialise with others. 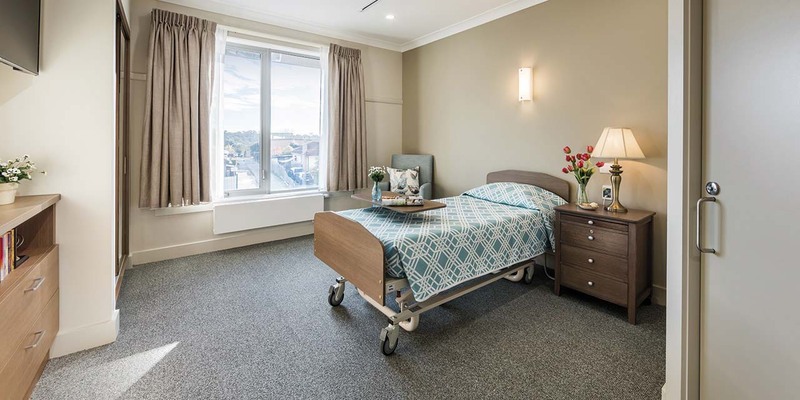 Floors are divided into two wings by a nurse station – each wing has its own dedicated dining and lounge areas so that residents (particularly those who are less mobile) do not have to travel far. A bathroom is also conveniently situated near each dining room. As well as standard cleaning services, we have on-site laundry and catering services. Residents can also enjoy use of our on-site hairdressing salon (appointments made directly with the hairdresser), mobile kiosk and chapel. Each Strathalan suite is private – so when you’re ready for a break from the hustle and bustle of life, you can retreat to your own space. And to make sure that our home is your home, we invite you to style your room as you please. Three different room types are available – see pricing snapshot for full details. Pleasant garden, mountain or street views. While pets cannot stay with residents, they are very welcome to visit with family or friends. Residents also become quickly acquainted with our friendly pet parrot. 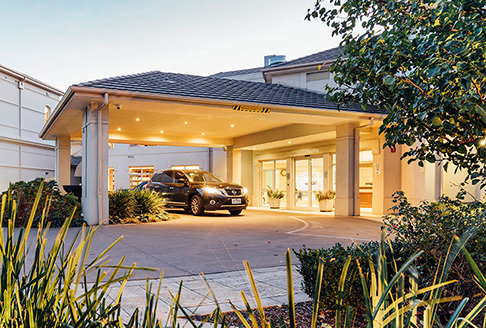 Strathalan is accredited to provide all levels of residential aged care (low to high), as well as more flexible respite care and end-of-life (palliative) care. Where possible this enables ‘ageing-in-place’, whereby residents can stay at Strathalan even if their health changes or their needs increase. 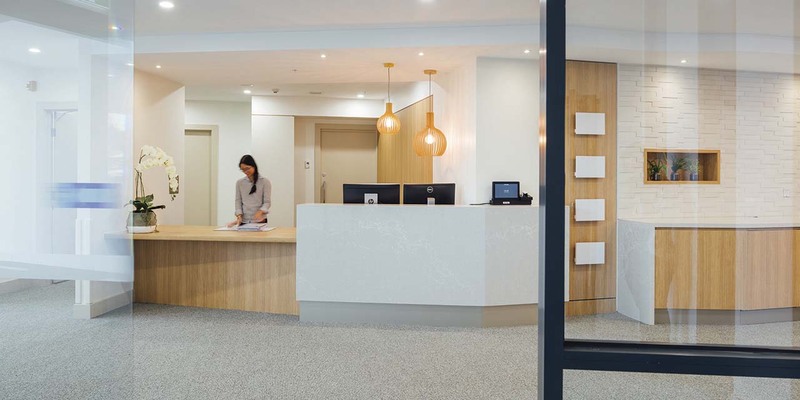 Upon arrival, the staff at Strathalan make it their priority to fully understand each resident’s individual requirements so they can tailor the care they provide accordingly. Qualified and experienced staff provide the highest quality of nursing-led care, with registered nurses on-site 24 hours a day, seven days a week. To provide the best of care to our residents, we maintain an impressive ratio of one carer for six residents. This care is further supplemented with a registered nurse stationed on each floor during morning shifts. Team members are assigned to a specific group of residents to enable continuity of care and ensure staff represent a constant, familiar presence in our residents’ lives. Meals are freshly prepared on-site every day by our chef and his catering team. The menu is planned in consultation with a dietitian, rotates on a four-weekly cycle and offers multiple options – for instance, residents can always select from two choices for the main course. Specific dietary requirements can be catered for (e.g. by offering diabetic-friendly or gluten-free alternatives). Our care philosophy centres around the wellbeing and happiness of residents – this includes helping residents partake in their hobbies and feel like they are part of the Strathalan Community. A broad range of social and therapeutic activities encourage active minds and active bodies, while ensuring that there is something for everyone. Examples include exercises, games, concerts and movies, bus outings and more specialised interest groups, such as knitting circle and musical activities. Strathalan has played an important part of the Macleod community since 1945 when it first opened. Residents are encouraged to engage with the local community through our lifestyle program – for example, they can enjoy scenic bus outings accompanied by morning or afternoon tea. Our strong community connection also extends to younger generations, with students from Our Lady of Mercy College and other local schools regularly volunteering and performing at Strathalan. Visitors are welcome at Strathalan and we warmly invite family and friends to use our shared spaces and take part in activities when they are here. 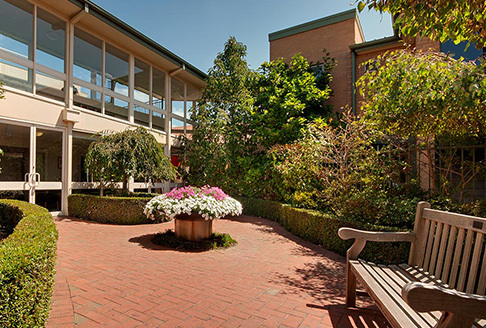 Our courtyards and gardens (including the winter garden) are all available for use, as well as our lounges and smaller sitting areas. A kitchenette area is available so that visitors can enjoy a cup of tea or coffee with their loved one. For more snapshots of daily life at Strathalan, follow Baptcare’s Facebook page. 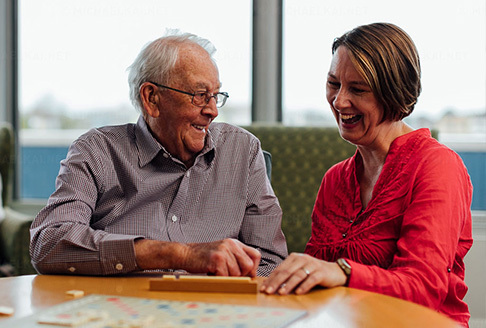 Pastoral care is an important part of life at all Baptcare communities, including Strathalan. Our chaplains are available to listen to residents and their families and journey alongside them, whatever their background or situation. We offer emotional and spiritual support, honouring each one’s unique spirituality and how they find meaning and purpose. Our chaplains also assist with prayer, worship, sacraments and other spiritual practices including regular devotional and church services where appropriate. 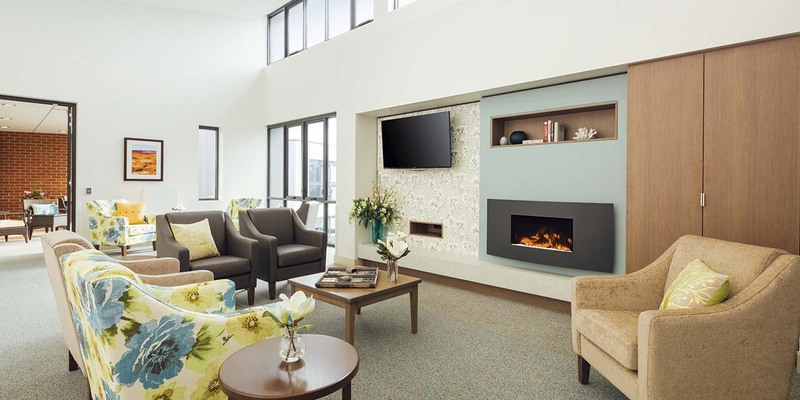 We take pride in offering a rich and stimulating environment for residents to promote their wellbeing. The calendar of events at Strathalan features social and recreational activities, as well as diversional therapies, to foster self-esteem and personal fulfilment. Examples include music therapy classes, pet visits and happy hour, as well as a walking group to make use of our tranquil gardens. Minds are kept active through games, competitive play, conversation and learning new skills (e.g. quizzes, bingo, word play, craft). Our model of care at Strathalan prioritises consistent daily routines that reassure residents and inspire confidence. However, we do encourage residents to try new activities and become actively involved in community life so they can maintain their interests and enjoy a full life. 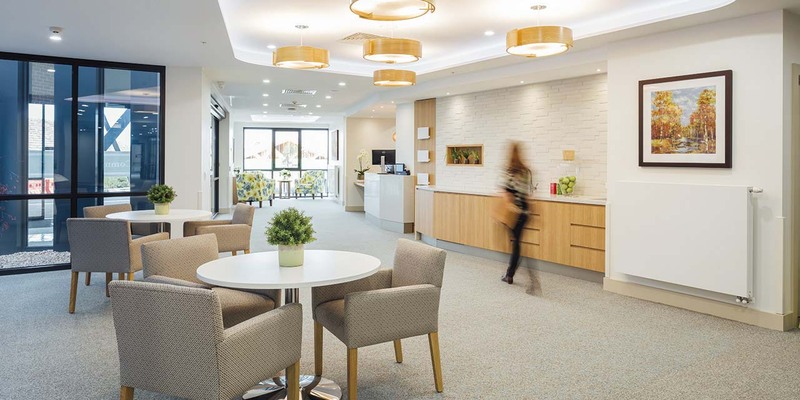 We invite you to see for yourself what life is like at Baptcare Strathalan Community. Book a tour online by clicking here or call 13 BAPTCARE (13 22 78) to arrange a time to visit our community.